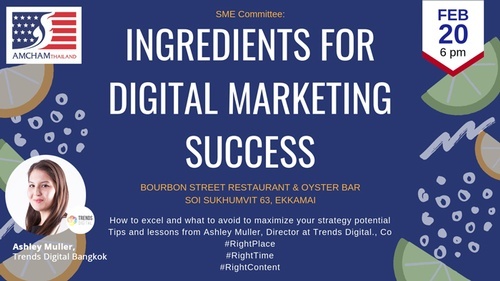 Please join the SME committee to hear Ashley Muller, Director at Trends Digital, speak on how to excel and what to avoid to in order to maximize your digital marketing strategy potential. Ashley Muller lives to disrupt. A digital native, Ashley joined Trends Digital Co., Ltd as Director in 2014 after several years working in the US, where she earned an MFA in Design and Technology from Parsons / The New School. At Trends Digital, Ashley leads key account teams in strategy, creative, and media and executes local and regional campaigns for major FMCGs and tech companies in Thailand.